I'm not sure that you noticed in the last post about replacing the door moulding, but something was missing, wasn't it? Here, take a look again. Do you see what it is, or was in this case? It was that silly piece of countertop! It's finally gone! I have been wanting to remove it for a while, but hadn't expressed that to Dylan before. Since it's kind of removed from the rest of the kitchen area, and it's right by the doorway to the rest of the house, it just becomes a junk collector. And I didn't want another one of those, because we already have one by the door to the garage, and it's hard enough to keep that one tidy, nevermind this one! 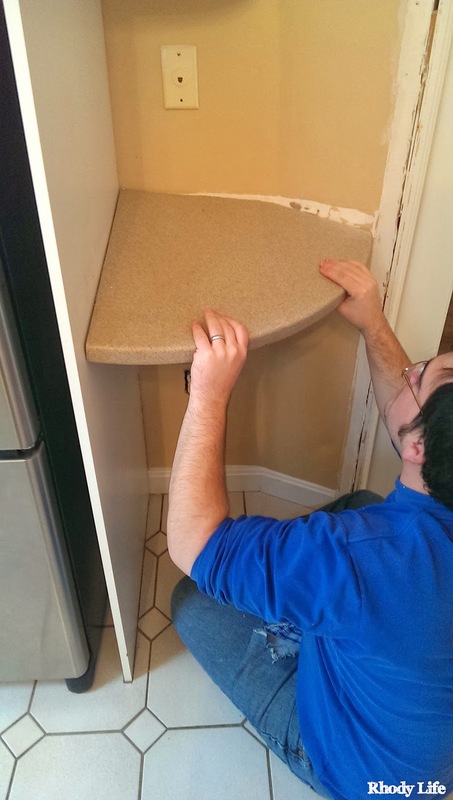 Plus, the countertop was installed at an angle, meaning not at all level, and had a gigantic crack through the middle of it that seems as if it was repaired with construction adhesive. Weird, I know. 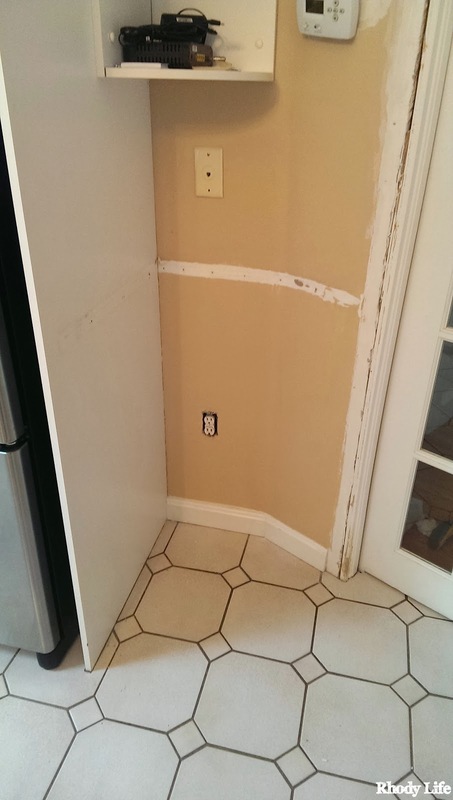 So, when we were painting the kitchen, I figured that that would be the perfect time - we could take it off, patch the wall, and paint it and no one would ever know that there was countertop there. But, as all projects tend to be, this wasn't as easy as it should have been. The picture above and the one below show the countertop, which is attached to both the refrigerator cabinet panel and the wall. But while you wouldn't think that should be a problem, what you couldn't see from above, you could see from below. 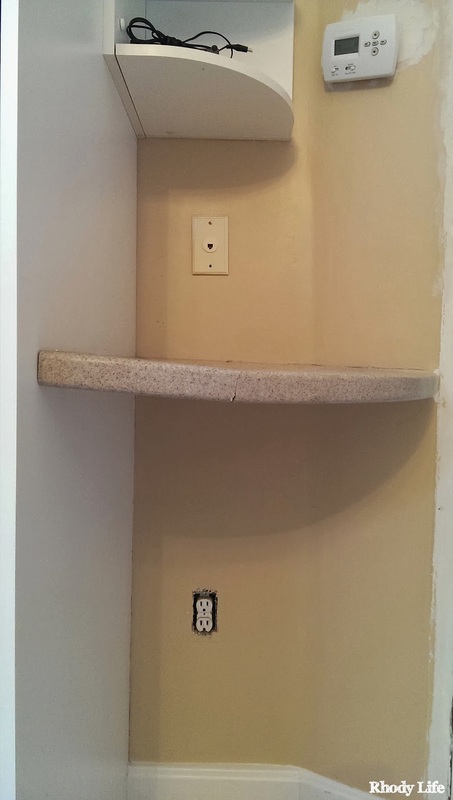 Since this was technically a floating countertop, meaning there aren't any cabinets underneath to hold it, it was braced and attached to the wall using a few pieces of wood. Makes sense, since that's an easy material to attach screws to. However, what isn't so nice is the amount of construction adhesive they also used. You can't really see it well in the picture below, but the countertop was attached to the wood pieces with about a gallon of construction adhesive, and then the edges of the counter AND the wood pieces were adhered to the wall and the cabinet panel with more construction adhesive. THEN, they used about 15 screws (not lying...) to attach the wood pieces to the wall and cabinet panel, you know, just for security. Oh, and don't let me forget to tell you that they decided that they needed to use more construction adhesive to go over the heads of the screws... Also, I feel like I need to say it again - construction adhesive. You're welcome. So, here's how we got it off the wall. 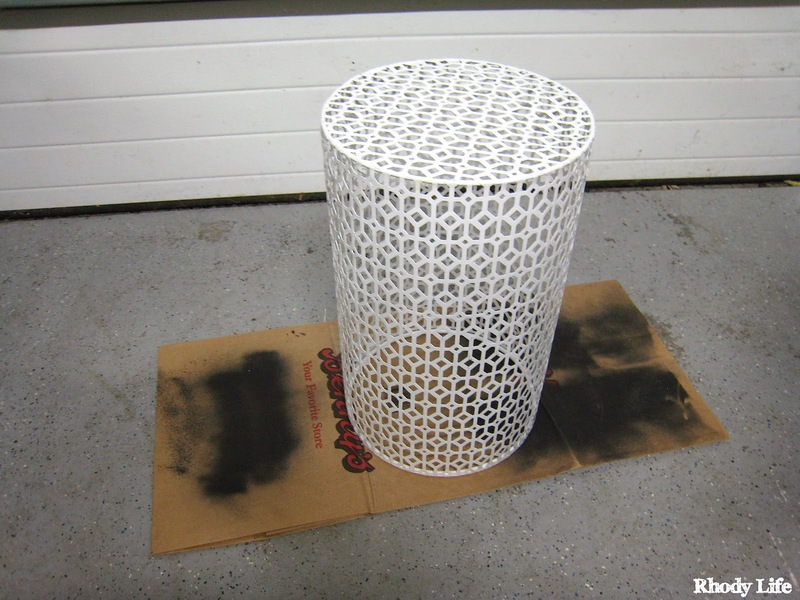 We scored the seams about ten thousand times with a box cutter, and then with the new drill that I bought myself, we removed the screws from the underside, after chiseling at the heads with the box cutter trying to get rid of all the junk. But, the counter was still really stuck on there. So we brought out the hammer, hit it a few times from both the top and the bottom, and that essentially did nothing. Dylan was finally able to get some of it to move after trying to pull and push and twist it off, and at that point, all it took was some really significant weight to get the rest loose, so I sat on the counter, gradually applying more of my body weight until it detached enough that we could get the rest off by hand. And it finally came off, after trying to remove it for about 20 minutes. So yeah, things never really go as easily as you plan them to. Especially since you see people ripping out countertops on TV all the time in about 3 seconds flat. Yeah, this little 2 sq. ft. countertop took 20 minutes. But, whatever, because it immediately looked better. I sanded down the area to remove the rest of the construction adhesive and even out the surface where it was painted around before we bought the house, and then slapped on some joint compound to patch the screw holes and some spots where the plaster had chipped accidentally. Once that was dried and sanded, we primed and painted it when we did the rest of the kitchen, and then decided to tackle the cabinet panel. I tried to scrub off some of the markings as best as I could, but they really didn't want to come off, so in the meantime, I have filled the screw holes with some wood putty, since the material is particleboard that is just covered in a white laminate, and I'll leave it like that for a while, as we have been brainstorming another project that could potentially be gigantic, time consuming, yet awesome at the same time. 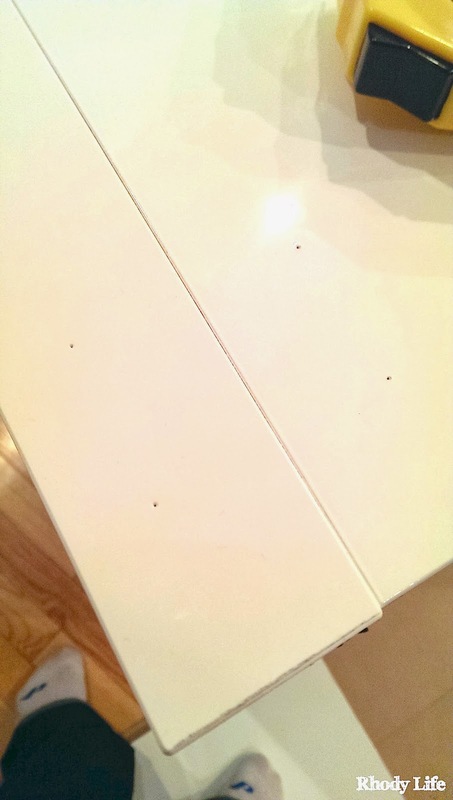 For now, though, the only evidence of there ever being a countertop there are the patched holes on the side of the cabinet panel. Looking at the wall, you would never know that there was once a useless, crooked, junk collector in that space. And I am so happy about it. 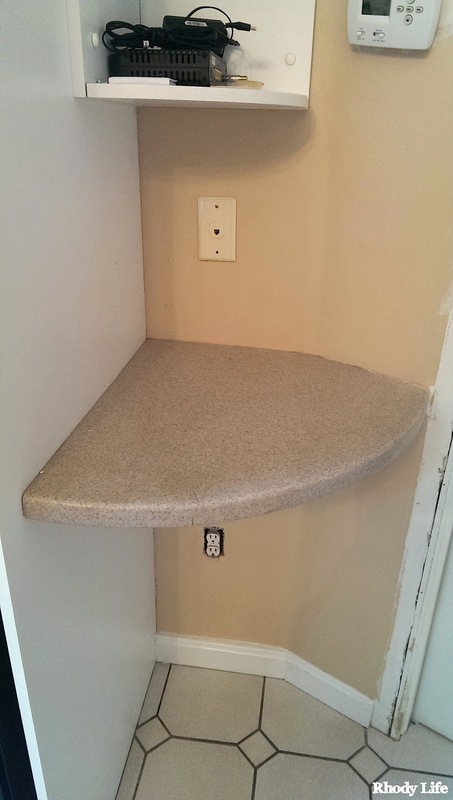 Have you ever removed your countertops before? Was it more difficult than you thought it would be too? 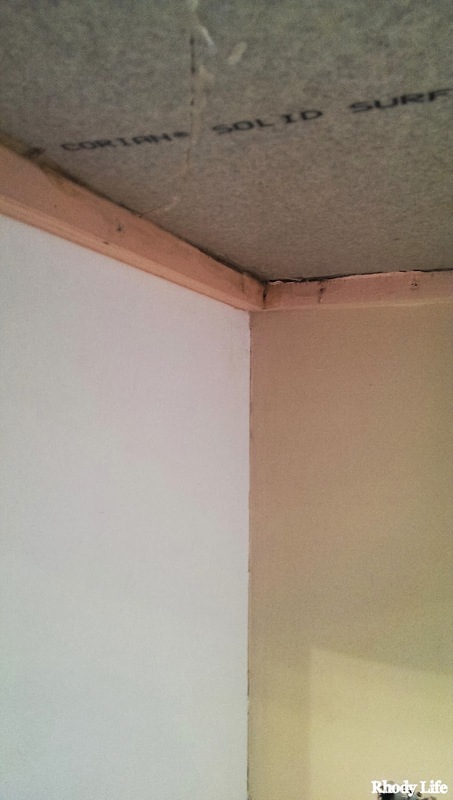 Or am I just the lucky one with a house that was built with construction adhesive? In order for this story to make any sense, I first need to give you just a little information. When my parents and my sister were living with us, their dogs were allowed only in the family room and the kitchen area, and very rarely ever were allowed in the other side of the house, which is where the first floor bedrooms and the large living room are. So, at night, the dogs would be all alone in that space until someone woke up to go let them out and feed them. Just before my parents moved out of our house, one of my sister's dogs decided that because my mom and my sister accidentally slept past 7:30am, which was normally breakfast time, that he was going to show us all how hungry he was. So, you ask - what did he eat? Well, he ate the door moulding. Now, while this may seem like a strange thing to decide to eat, whereas most dogs would probably go for a pillow or a pair of sneakers, at least he ate the door frame that was by the door that leads to the bedrooms, so he was making a point. Anyways, just before they moved out, my dad ordered a new piece of moulding to replace the one that was chewed, and repaired the part of the interior frame that was chewed as well. When all of the contractors were working at their new house, they asked to use the miter saw to make the cut, and my dad just used the old piece of moulding as a guide, so no measurements were needed. They then returned the moulding to me and I put it in the spare bedroom until this past week, where I finally installed it. This was my first attempt at installing moulding, but I have to say, it was easier than I thought. Granted, I wasn't making the moulding from scratch or trying to put up all of the trim pieces, but it was still new to me. But enough with all the blabber, let's get to the steps I took, shall we? First, you'll notice that the trim has been off for a while, so I ended up painting into the spot where the trim is, but that's really actually a good thing, because that means that I won't need to break out the gray paint again after the install. So, I made note of where some of the nail holes were that were used with the old trim, that way I wasn't nailing the trim into the existing holes and I was making new stronger holes. Also, since there is a pretty significant gap between the sheet of drywall and the rest of the door moulding, I wanted to make a mental note of that too so that I don't try to put a nail into the trim and then attach it to the space between. That wouldn't be too much help in securing the piece of trim to the wall. The other thing that I needed to do before I put the trim up on the wall was to make sure that it would line up properly with the nail that will attach it to the top piece of moulding. Since the existing nail actually split the top moulding, I was stuck with using it's existing hole, so I needed to make sure that when I attached the new piece, that the nail wasn't going to go through the board, while at the same time, make sure that it would hold the two pieces together correctly, with as little gap as possible. Finally, it was time to put a nail in the moulding. Using my foot to push the bottom towards the wall, and my hands to line up the top, I placed the board in place, and then hammered in the first nail, right in the middle of the board, but hugging the left side of the moulding so I could make sure it would go into the drywall and not into the empty space. I chose to put a nail in the middle first that way I could still twist the moulding if I needed it to match up a little bit more at the top. I tried to take a picture of this process, but as you know, my camera is having some issues, so I ended up looking like a giant blurry blob and the only thing in focus was the right side of the door. Anyways, following that first nail, I then made sure the angle matched up with the angle of the top piece of moulding, and then hammered a nail into the top, making sure it wouldn't interfere with the nail that would attach the two pieces together. After that, it was just time to put in the rest of the nails, with the help from a handsome kitty cat, who was very interested at what was going on, but promptly ran away as soon as he heard the hammer banging on the wall. Following an alternating pattern, I hammered in the rest of the nails, so one on the left, then one on the right about 10" higher or lower, depending on the direction you are going. After putting in the nails, I realized that I didn't have a Nail Set tool, which is the tool that is typically used to countersink the heads of the nails. But, I got creative, and instead, I used a star-bit that was just smaller than the head of the nails so that I wouldn't mark up the moulding any more than the nails already had. So, don't feel the need to buy one of those tools if you don't have one, especially if you will only have one project to use it on. And with just a few taps of this star-bit on the head of each nail, they were pushed just slightly further into the moulding so they could be caulked and painted over. So with that, I pulled out my trim caulk, which actually dries clear, but shiny, and ran a bead along all the seams of the moulding. The caulk dries enough to paint within an hour, but I have yet to pull out my trim paint and get to work. But, for now, at least the trim is back up and we aren't staring at a rough looking door frame anymore. 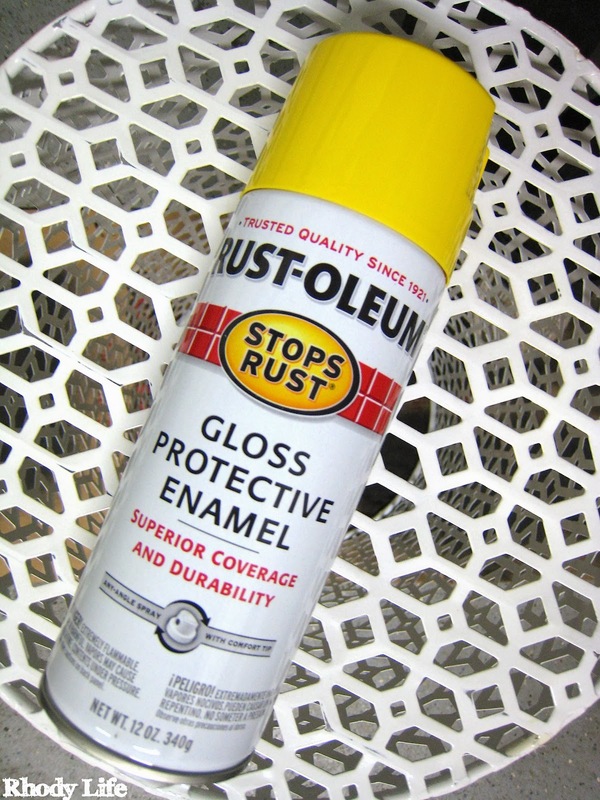 It's possible though, that I will break out the paint brush and trim paint tonight, since I'm tired of the nails showing through and the wood putty down at the bottom of the interior door frame from where the dog chewed it. I am happy that I got to practice with this little project, and it was much easier than I anticipated. It was good to learn the steps, since I have plans to mimic the chair rail and wainscoting that is in the hallway for the living/dining room. Have you had the need to replace your door moulding before? Have you ever installed an entirely new set of moulding? What problems did you end up with? 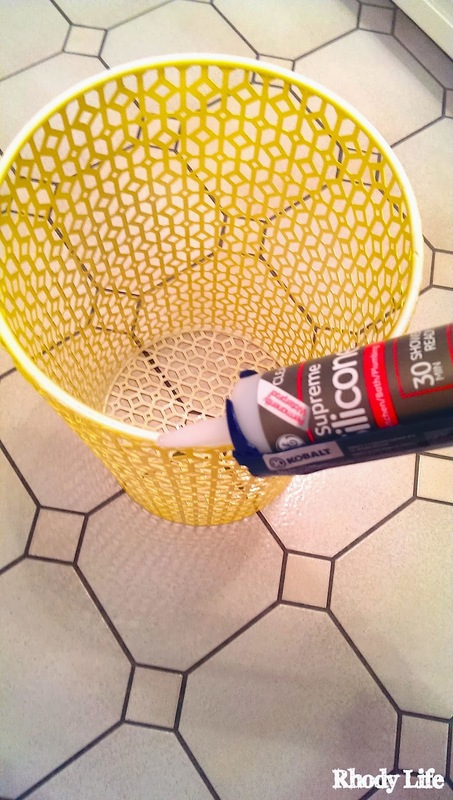 Ok, so this isn't the most mind-blowing DIY project ever, but it's a cute, quick, and very inexpensive way to add some color to your space, especially in the middle of winter. I don't know how the weather is where you are, but here in Rhode Island, we've had some extreme cold, and last night we got hit with about 10" of snow. So, now that we are buried in a sea of white fluffy stuff that just makes the roads awful and ugly looking, all I want to see in my home are green plants and bright colors that remind me that Spring may be (or is hopefully) right around the corner. Luckily for me, the paint colors that I have chosen for the house are all bright and cheery, so as soon as I get back to painting, all should be looking good. 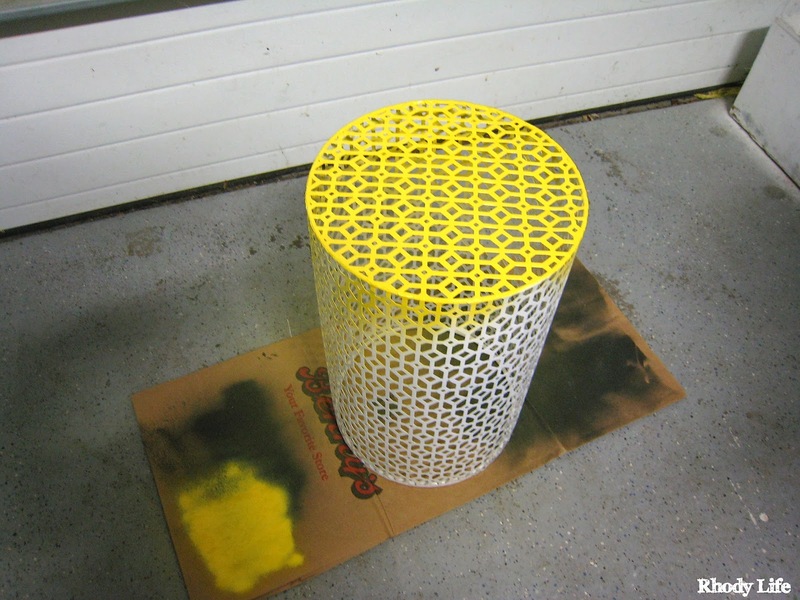 But, for now, I wanted to bring in some of the primary yellow that I have chosen as an accent color in the family room. 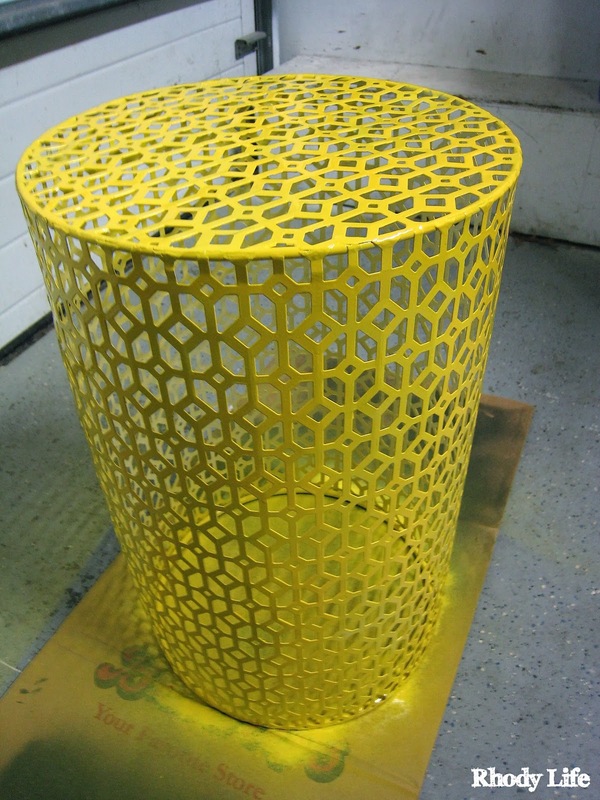 Right now, the only yellow in the space is the yellow end table that I showed you last week. And the bookshelf that we have next to the TV is still empty. Turns out that I have a ton of leftover vases from the centerpieces at our wedding. As you know, I put one to good use, and planted an avocado pit in it, so now my pretty little avocado tree is growing quickly and happily. But, that still leaves me with 9 vases since we had bought enough for 12 tables and a couple ended up with chips along the rim. I grabbed a vase out of the cabinet, wiped it out and then did something somewhat unexpected. Using my yard stick, I measured the inside depth of the vase, and then I measured the diameter. I took the diameter and an online calculator, and found the circumference of the vase and then added 1". Now, you may be wondering why I needed to take measurements, right? Well, since I was planning on using fake flowers to brighten up my space (cats are the reason why we can't have nice things real plants), I didn't want the fake stems showing through the glass vase. So, I grabbed a piece of scrapbook paper from my stash, making sure that the colors were going to match the space. I made small marks on the scrapbook paper that showed the depth and circumference of the vase, and cut the paper. If you don't have any scrapbook paper, I'm sure you have some wrapping paper laying around somewhere, so that could be a great alternative! 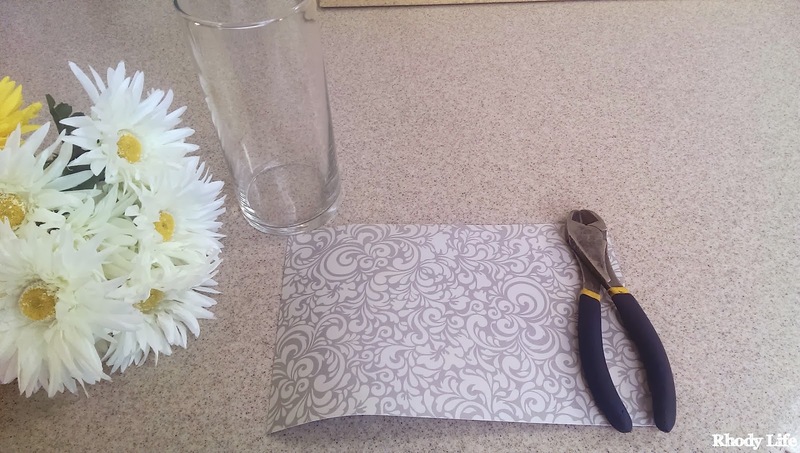 Once the paper was cut, I rolled it up and slipped it inside the vase, and the extra inch that I added to the circumference helped make sure that the paper overlapped just a little bit so that there wasn't a gap showing. 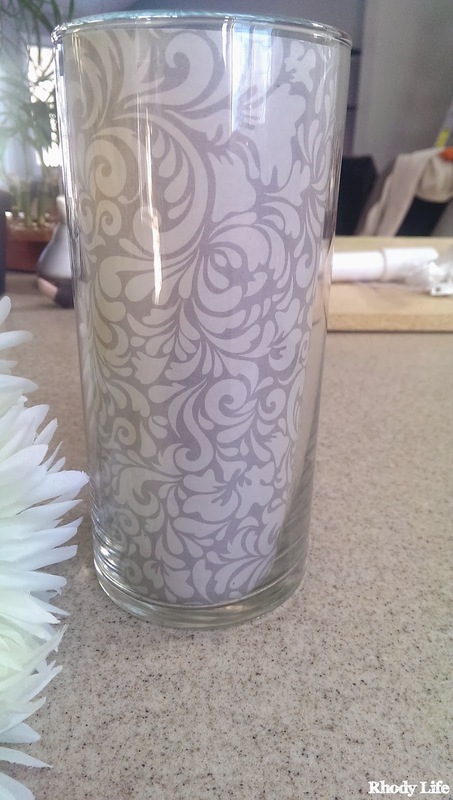 Just like that, the once boring clear glass vase was transformed and looked really cute! The next step was to cut the flowers. I had bought some fake flowers last Fall for the front door, and they were on sale so I got them at a really nice off-season discount. 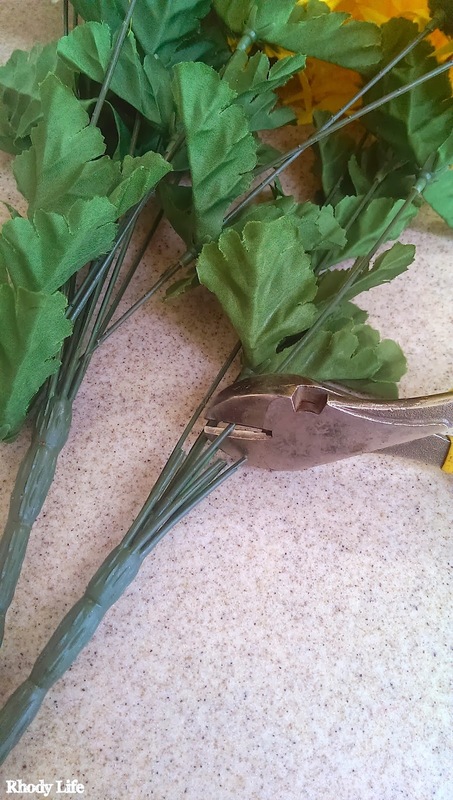 They are the kind of fake flowers that are all attached together on a giant stem, so I took my wire cutters and clipped them off the large stem, and then slipped off the fake leaves from the stems. You don't need to be too particular about the exact spot that you clip the stems, as it's probably better to have them different lengths, that way you can make your arrangement more dimensional with height. 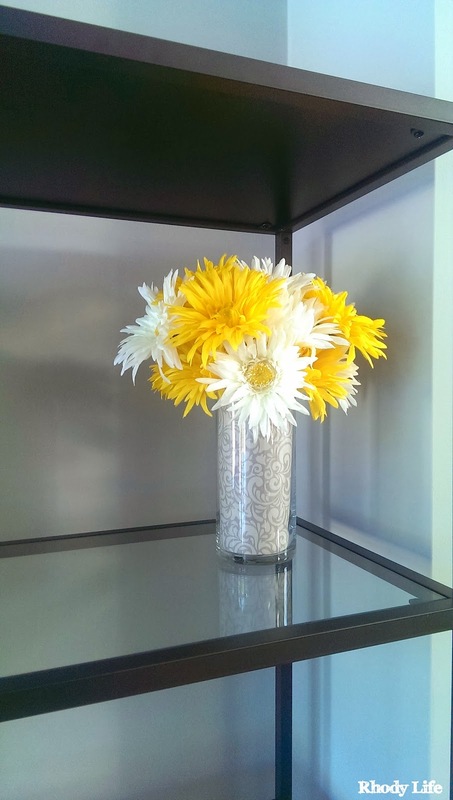 The only thing left to do once you have the flowers cut is to arrange them in the vase. 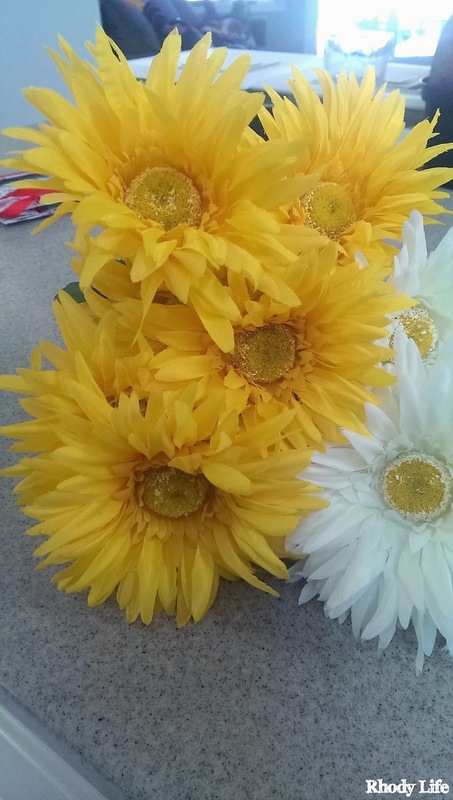 Since I was using both yellow and white flowers, I wanted to make sure that the colors were mixed in well, and because the flowers have wire stems, I was able to bend some of the stems so the flowers showed more. 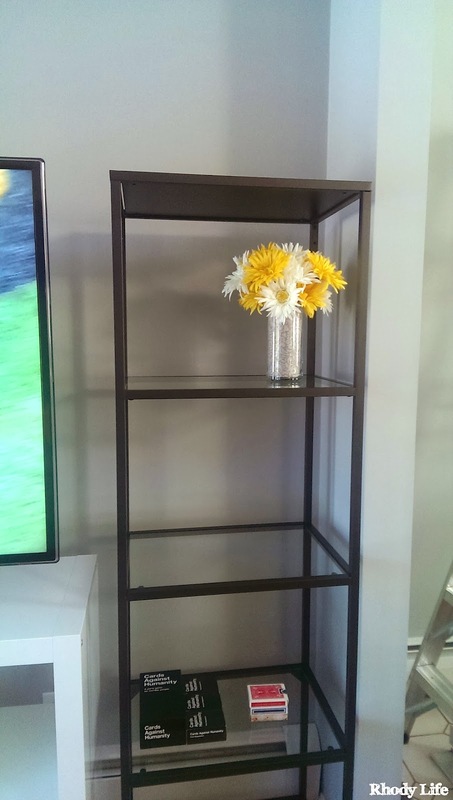 Once I was satisfied with the way it looked, I placed it on the shelf by the Expedit television stand and I love the way that it looks now. It adds in that bright pop of color that I need right now. Plus, it makes it look just a little better now that there is something more than Cards Against Humanity on the shelving unit. And now it's time to get some other trinkets to put on the shelf, because this is still way too barren. 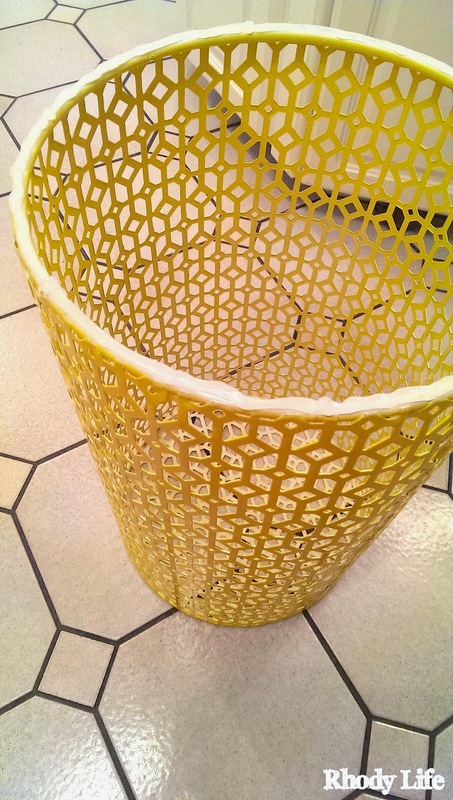 Plus, sometimes, accessories can be so much more fun than the big furniture items, right?! Do you have any suggestions on what I could put on this unit? I'm looking for pops of color - purple, yellow, silver, and white. Is it possible to go overboard with plants and flowers? I kind of have an obsession with plants right now. 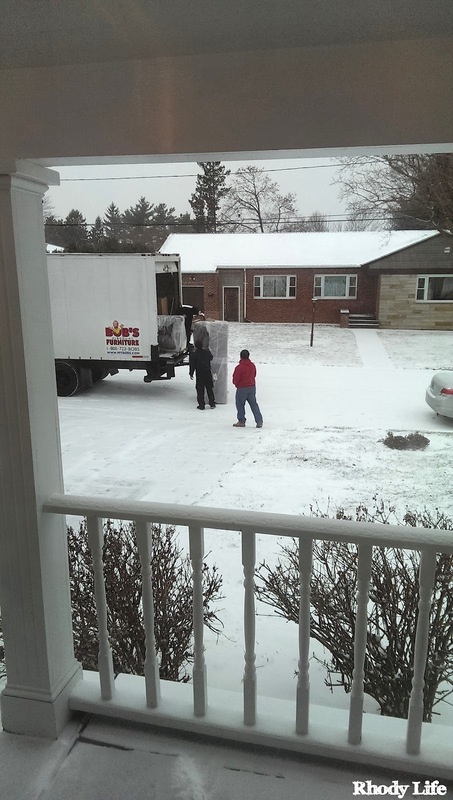 Just about two weeks ago now, we had our couch and oversized chair delivered to our home, during the beginning of a snowstorm. We had received a gift card from my parents and sister for Christmas to Bob's Discount Furniture, a local to New England furniture store that has some pretty great pieces at a really really lost cost. While their pieces may not last forever (and that's just an assumption...we've had no experience with them before until now), they fit the budget that we wanted to spend while at the same time having the colors and styles we were looking for. I had done my research on their products online, and then went into the store back in early October to talk with someone about pricing and the additional features. While I was there, I got a printed quote that we could bring back into the store when we were ready to order, which we did on December 29th. One of the greatest parts about Bob's is that their furniture is not made to order - it's all stored in a warehouse, which meant that even though we placed the order on Sunday, we would have our furniture on Thursday morning. Crazy fast, right? So that's just what we did. We signed up for the "Breakfast with Bob's" early morning delivery, which was a delivery window of 6:30am-9:30am, that way neither of us would end up needing to take a full day off of work for delivery. They arrived a little later than their online tracking system stated, but that was because the snow fall was adding some time onto their commute, and I didn't mind really, especially since they still arrived well within their given time window. 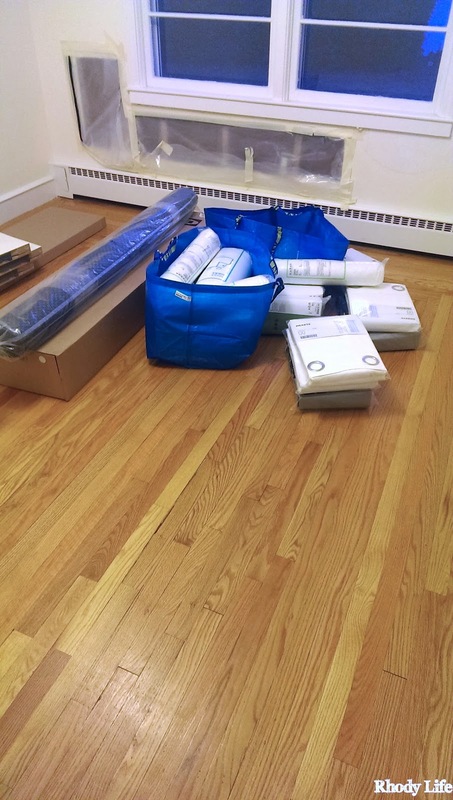 The two guys brought the couch, the chair, and the ottoman into the house, unwrapped them, put on the legs, and took all of the packing products with them, which was perfect! And within a half hour of them arriving at the house, they were gone and we had furniture! But, the arrangement didn't quite go as expected. Turns out that the oversized chair that we purchased is in fact really oversized - 53" across! In fact, too oversized for where we wanted to put it. 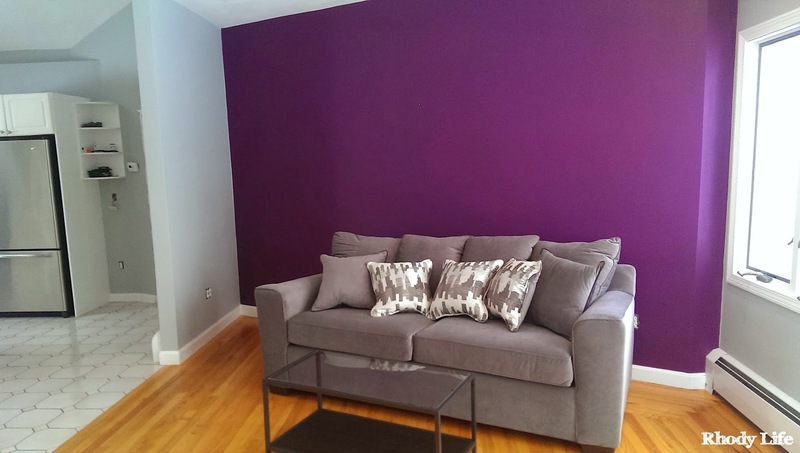 The original plan was to put both the couch and the chair against the purple wall, but because of the angled wall and the gray wall jut-out that you see in the picture below, the two just didn't fit right against the wall together, even though I measured how they would fit. The chair ended up overlapping onto the tile floor of the kitchen and it really just didn't look right, and was quite crowded. 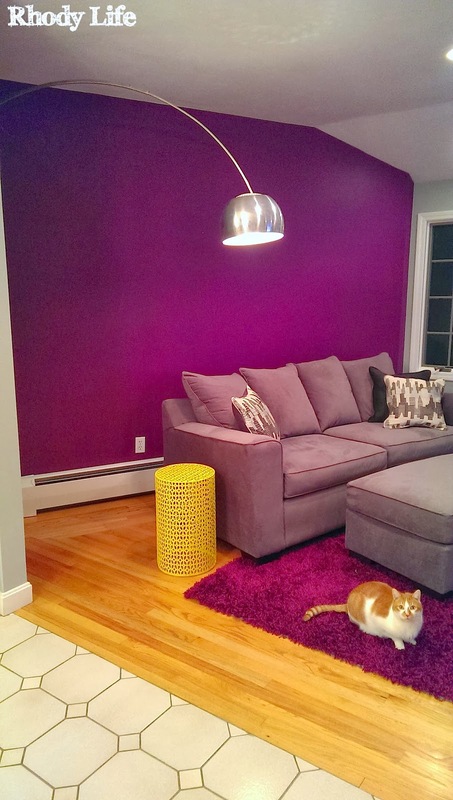 So, we left the couch up against the purple wall, and put the chair in the corner next to where the television is. And this is what we are going to work with now. I'm hoping that it's not going to be too crowded over on that wall, with the TV stand and the bookshelf there. But, you'll see soon how things have ended up over the last few weeks, since we have started adding in all of the other layers to the room. Have you ever ordered furniture expecting it to go somewhere specific and then realized it just doesn't work the way you wanted it to? What have you done to overcome this issue, and how did you resolve it? Looking for some modern and mid-century themed chairs or seating for your home? Look no further! This week's items on the flash sale sites really had me breaking out my credit card more than once! I love this style of furniture and was so excited to see how many different options there were for seating this week! Between counter-height stools and dining chairs, you could furnish every part of your home with these chairs and stools! And oh my gosh, that Purple Swan Chair! SWOON!!! I have searched for weeks now (literally, at least 4 hours every day) looking for two of those chairs that are both adjustable and swivel, and come in that exact color, but every single one is too expensive. Even this one, but I still love it just as much! Which chair is your favorite? Other than the swan chair, I'm torn between the Organic Conference Chair or the Lippa Dining Chair! 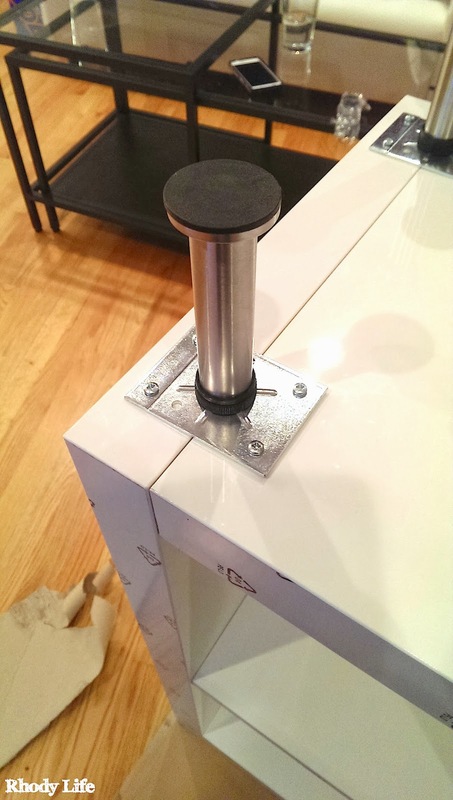 One of the things that I like the most about IKEA furniture is that not only does it have clean modern lines and awesome colors, but they all have the potential to be hacked! 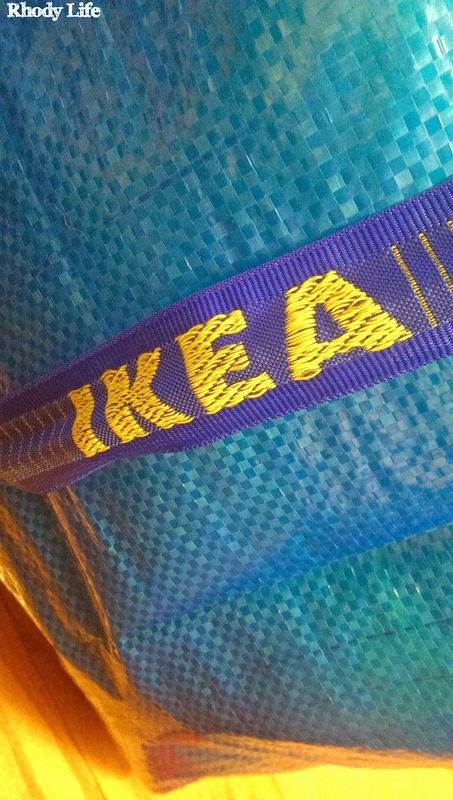 There is an entire website dedicated to hacking IKEA furniture, and I'm no stranger to hacking, myself, as you'll remember my Orgel lamps that I hacked to add fabric shades. 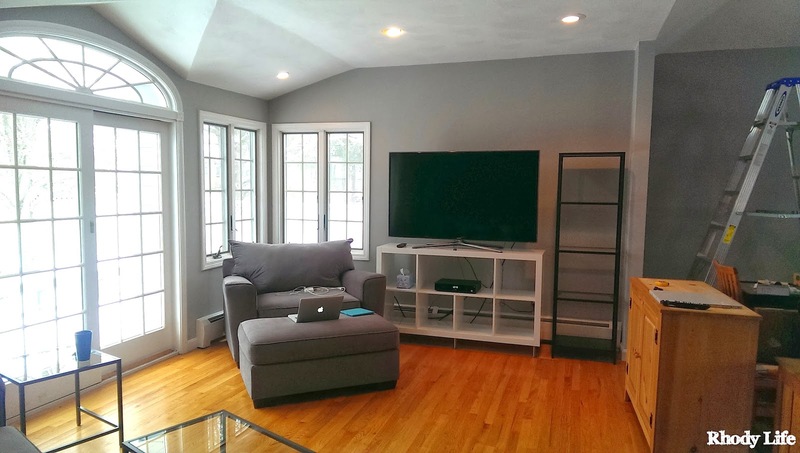 Ever since I began designing the Family Room, I knew that I wanted the IKEA Expedit as the TV stand. The fact that it had all of these little cubbies to put our DVDs and video game consoles was perfect. However, the cubbies aren't exactly wide enough for a DVD player, and likely not wide enough for your Cable or Satellite box either, as those are typically around 15" and the cubbies are about 13". To solve this, we decided to hack the unit, which didn't require any power tools or saws, which for Dylan, meant that it was perfect! We followed the normal directions on setting up the Expedit unit, by attaching one of the long sides to one of the short sides first. We put on the first short shelf, then the first long shelf, and then this is the point where we made some changes. Instead of doing another short shelf and then a long shelf, we did the opposite - a long shelf and then a short shelf. And yes, I know that sounds confusing, so I made you a diagram. The black thick lines are the outside borders of the Expedit. The small red lines are the small shelf dividers, and the long green lines are the long shelf dividers. 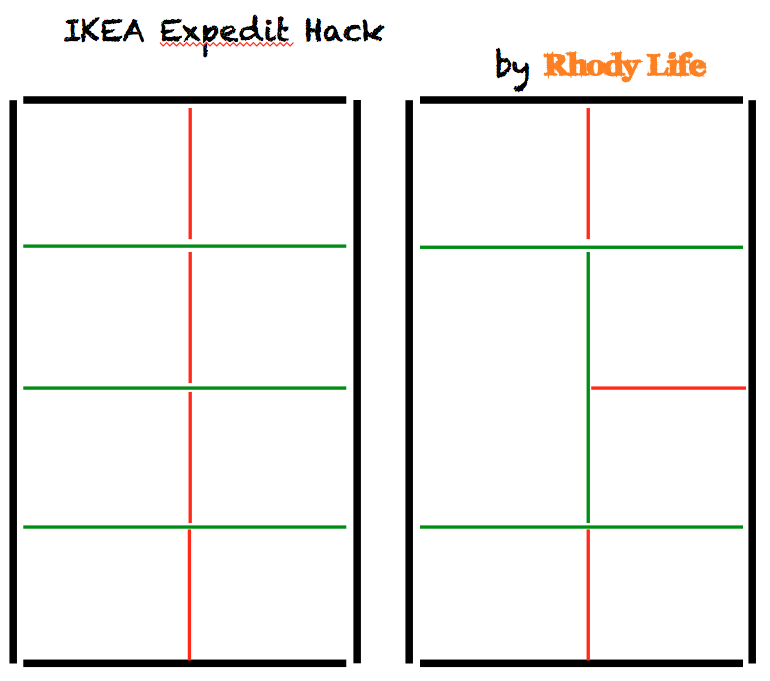 The layout on the left is how the Expedit is supposed to look, according to IKEA, and the layout on the right is what we did to make it fit our needs. It's a little easier to see how we made the change now. Instead of putting a short board underneath the top long horizontal board, we put another long board, this time going vertically. And then to the right of that long vertical board, we attached a small board, horizontally. 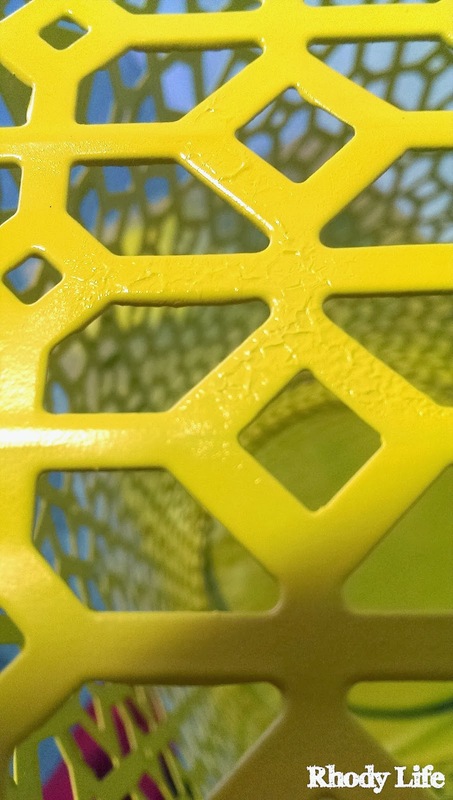 Because all of the pieces are essentially identical in the way they are put together, we didn't have to make any new holes for the dowel pegs to go through. We did, however, have to make 4 of the wooden dowel pegs shorter. The long boards (the green ones) have holes that go through completely so that they can attach to both of the short boards (the red ones) that meet up with it. Because of this, and the fact that we are using one of the long boards "improperly", we had to cut about 3/8" off from 4 of the pegs so that they didn't stick up through the long board and into the space we want the Cable box to go. Not a big deal though - it was really easy. In fact, you don't even need a hack saw, although that would work really well. We ended up using a large pair of wire cutters and it was perfect, although I bet you could get away with kitchen shears, pruning shears, and possibly even a flat-head screwdriver and a hammer, like you would use a chisel. After you have rearranged our boards, you may declare yourself done with this project, but we still had one more small hack to complete - attaching legs. Since our unit will be placed on the long side, in order to hold our TV, we wanted it up off the floor so that the heat from our radiators could pass underneath it, and also for easier cleaning and so that the long side of the Expedit doesn't get too scratched when it's moved. 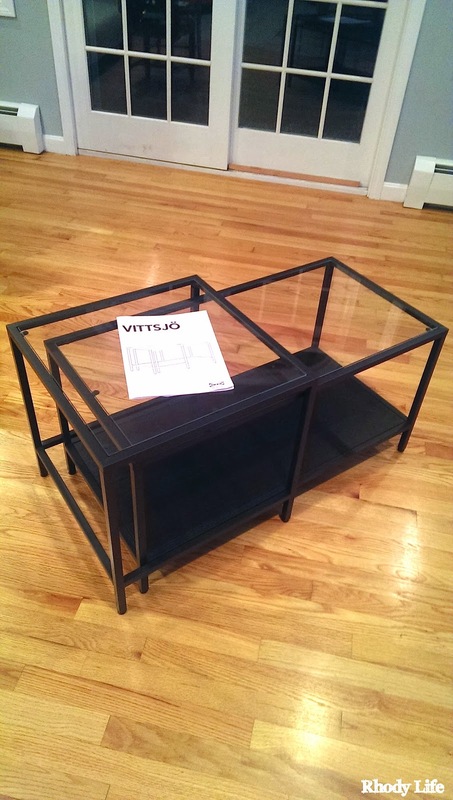 So, enter the IKEA Capita legs. 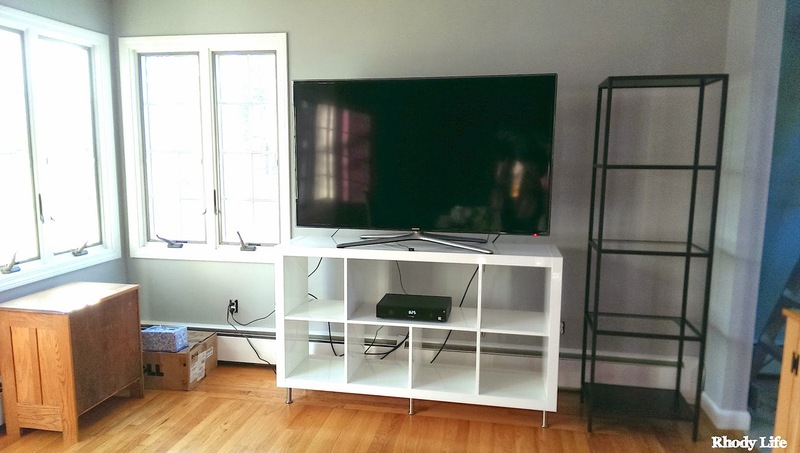 We originally got the 8" legs, but after getting the Expedit set up, we realized that adding 8" more to it's height would make the TV too high, so we exchanged them for the 4" ones. They also have 6" ones available if you're interested. Anyways, I wasn't too logistical about placing the legs on the bottom, so I lined up the legs with the corners of the unit, and then pushed them inward about 1.5" so the screws didn't interfere with the assembly of the unit at the corners. The last thing I want is the piece to fall apart with the TV on it, right! First off, make sure that if you hacked the shelf arrangement, that you are putting the legs on the side you want down. You really don't want to go through these next steps just to realize that you put the legs on the top instead of the bottom! So to attach the Capita legs, I just used one of the screws that came with the legs, and made a small indentation on the surface of the Expedit in where each screw will go, using the hardware as a guide. Using my drill, although a screwdriver would work fine too, I then attached the legs to the Expedit using the screws that were in the unit package. 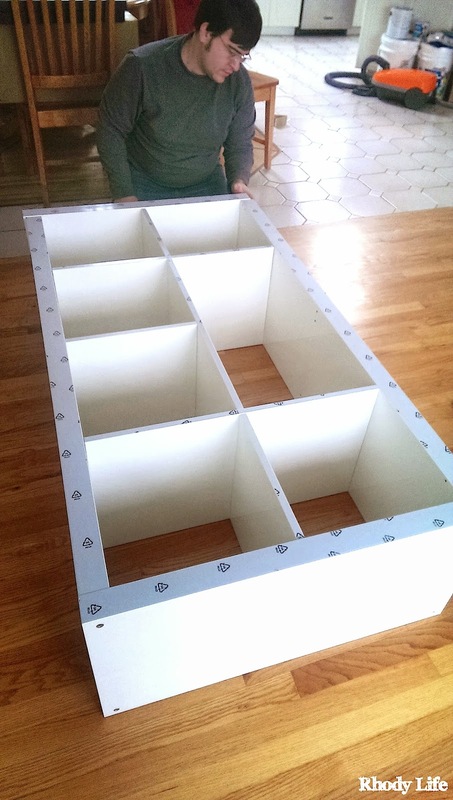 I did not pre-drill the holes, as the interior of the Expedit structure is not solid wood, so they went in very easily. Depending on the weight of your television, you may want to add a leg or two to the middle of your unit. Our TV only weighs 50 pounds, but I just wanted to be extra careful, especially since we technically removed one of the weight-bearing shelf dividers from the unit. 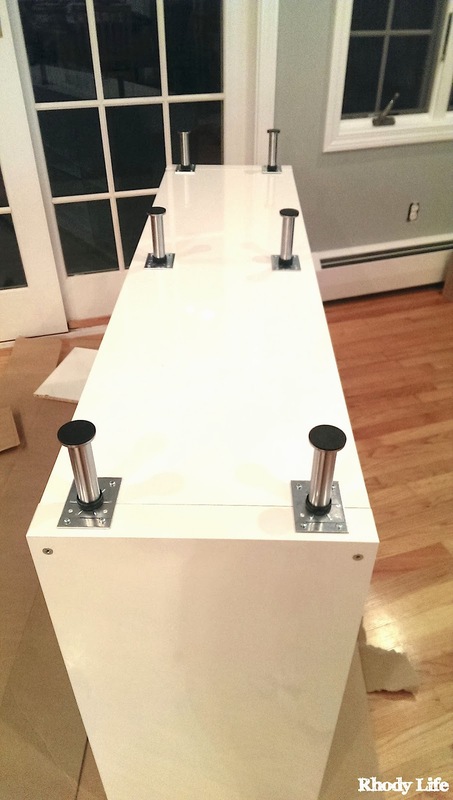 Once you have your legs attached, you can flip your piece over, set it in place, and then place your TV on top! Our Cable box now fits in the top cubby, and when we bring the DVD player downstairs, it will be placed right under the Cable box. I think this looks great, and I can't wait to fix those cables back there so they don't show. And I have another neat little project planned for the Expedit - yes it is another hack. And I can't wait to get started on that project and show it to you! 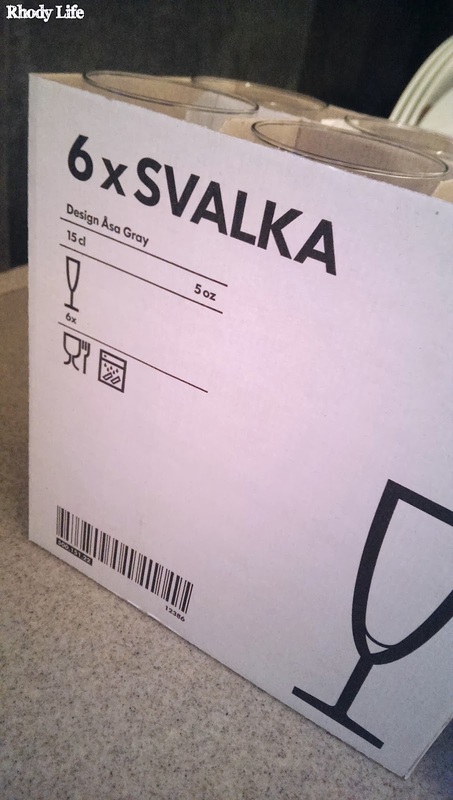 Have you ever hacked an IKEA product? What did you do and how did you do it? In honor of the blizzard that we just got hit with, I figured I would feature all things white this week. From comforters to desks, these white pieces can really bring some brightness into your space, and really make it seem more like spring instead of winter. Which piece is your favorite? I love putting pops of white in rooms, especially in furniture because a white rug would never stay clean in my house, whereas a piece of furniture could always be wiped down. In fact, I can't wait to to share with you the piece of white I am using in my house!